Posted March 26, 2010 by finnfemme & filed under Book review. 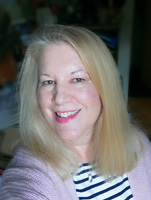 Being a newly minted Hay House New Release Reviewer, I was excited to learn that my first book to review would be ‘The Shift’ by Dr. Wayne W. Dyer Available at Hay House. I got my free copy in the mail in order to review, and blog about it. It was such a slim volume that I thought I’d speed through it and be able to post my blog in record time. Well that was not the case. In fact, I think it was the longest amount of time I spent reading such a short book! I have been a huge fan of Dr. Dyer, ever since the 70s when I read his first book, ‘Your Erroneous Zones’. I have always appreciated his simple, practical, and forthright way of writing, and conveying the message that we have so much control over what we think, and how that affects everything in our life. I’ve read most of his books over the years, and watched his fabulous shows on PBS. My very favorite book of his is ‘The Power of Intention’. I actually had to get a second book because my first one was so marked up with highlighting and notes that it was distracting to read! I like it because it has clear, practical practices that you can put in effect immediately. I refer to it often because, well, I can get off track and get in a negative energy mode. ‘The Shift’ is such a very different book from his others. It started out with quantum physics, which I had a hard time wrapping my brain around. In fact, I kept falling asleep after reading a couple pages at a time (this is why it took me so long to read it)! Then he delves into making the shift from ambition to meaning; from being ego-driven to being connected spiritually. I could tell that it is probably the most intimate writing from Dr. Dyer, as he really reveals his personal feelings and emotions at this stage of his life, and his own spiritual connection. I liked the book, but personally, didn’t really love it. It’s a little more ‘out there’ than I like. I already have a relationship with God, so I don’t feel like there’s much of a dramatic ‘shift’ that needs to be made in my personal spiritual life. I do need work on being ego-driven (I think we all do! ), and that is something that I will continue to work on. I appreciate and understand the spiritual journey that Dr. Dyer is going through at this time. But I will always like best, hold true to my heart, and practice, the ever so wonderful practical-thinking advice of Dr. Wayne W. Dyer. Posted March 25, 2010 by finnfemme & filed under Daily Life, Fashion, Vintage. I delight in the serendipity of thrift store shopping. Those times when I run across something so wonderfully unique, that I take pause to wonder if it was placed there fully intended to be found by me! My latest occurrence was yesterday, while I was looking through the miles and miles of designer fake vinyl purses that tend to populate the thrifts. Anything made of real leather jumps out at me, and I spied a large, thick leather hippie type of purse that I remembered from the 70s. They look like they were handmade by some sort of folksy artisan. 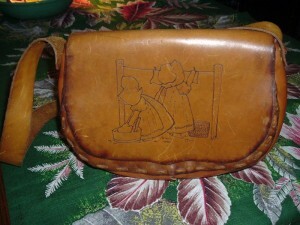 As I was marveling at the heft and substance of the purse, I noticed an amazing etched drawing on the front flap. It was of two little laundresses with washboard and tub, and hanging laundry on a clothesline! Of course, it had my name written all over it; being an avid laundress/clothesline user AND adoring and collecting vintage purses. I need another purse like I need a hole in my head, but I could not leave without it! No one else would ever appreciate the unique whimsicality of it like I would. I like its large size and durability. It’s been heavily used but there is hardly any wear to the thick leather. It’s just so delightfully funky; the juxtaposition of the sweet, quaint laundry scene with the rugged hippie element is hilarious! I’m sure that there is no other like it in the world. Posted March 22, 2010 by finnfemme & filed under Fashion, Vintage. 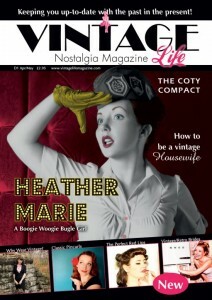 As of March 12, the digital version of Vintage Life Magazine is now published… and it is wonderful! Since I had written an article for it (“The Art of Washing Vintage Clothing”, pp 18 & 19), I was excitedly looking forward to issue #1. Nervous too, as I didn’t really know what to expect! I had written the article, took the accompanying pictures, and submitted it. And waited to see how the article, and overall magazine would actually look. The magazine is in a word, fabulous; if I do say so myself! The layout is perfect, and the articles are fun, interesting, and spunky! It is the first of its kind to publish a magazine for vintage-lovers…there is really nothing else out there like it. I am so happy to be a part of it! The magazine is currently digital only, but the editors tell me that they hope to go to a print version too if the word is spread far and wide. I prefer print versions of magazines, as I know a lot of people do. This glorious magazine needs to be in print, so help me in getting the word out there! Posted March 10, 2010 by finnfemme & filed under Daily Life, Fashion, Vintage. I love finding wacky ads in vintage women’s magazines, especially the laundry soap ads. 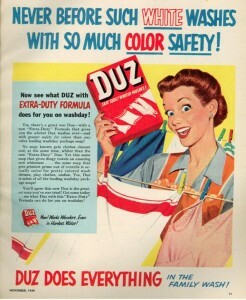 Take for example, this fabulous DUZ ad from the November 1949 Woman’s Day magazine. It has all the attributes that I love in an ad; colorful drawing, bold lettering, exclamation points, and a wildly happy housewife, ecstatic over her DUZ detergent! And being a clothesline enthusiast, I love the fact that not only does the housewife have her laundry on a clothesline, there is also clothesline pictured on the DUZ box. Double the fun! I almost reach this state of elation when I hang out my clothes… almost. I cede to artistic license on the part of the copywriters, but I do have fun! I really love clotheslines. They genuinely make me happy. There is nothing more gratifying than seeing my laundry out on the line, soaking up the sunshine and swaying in the breeze. It must be something primal, since all of our ancestors from the dawn of time air-dried their laundry. I actually look forward to those laundry days when the weather is nice enough to hang outside, and Mother Nature can do her business of drying the clothes. During inclement weather I dry inside on drying racks. It’s sufficient and does the job, but it just doesn’t quite have the joie de vivre of using an outdoor clothesline. The poignant scent of line-dried laundry. There is nothing like it. It changes with the seasons, picking up the nuances in the air. The cold, ozone-y smell in the winter, the fresh cool scent of spring, the sunshiny scent of summer, and the brisk aroma of fall. All subtly different, but with that unmistakable underlying familiarity, no matter the season. That alone is reason enough to keep me air-drying. This is my clothesline in my backyard, taken in the midst of a heatwave last summer. Summer is so phenomenal for drying. I like to time how long it takes to dry in the heat. I think the record for my laundry drying was just one hour, in over 100 degree heat. But mostly I just like to look at the clothes hanging. It is like hanging art; installation art, if you will. In any event, it makes me happy. And if I get whipped up into a frenzy like the DUZ housewife, so be it! Winter… Spring? What Season Is This? Posted February 21, 2010 by finnfemme & filed under Daily Life. For the past week or so here in the Pacific Northwest, we’ve have the most spectacularly gorgeous weather! Atypical brilliant sunshine and warm, balmy temperatures. The plants are budding, the lawn is growing, and the pollen is flying! This has created quite a dichotomy in me, and has me a bit befuddled. It’s weird watching the Winter Olympics when it feels like spring. Of course, Vancouver B.C. is having the same kind of weather so it makes it even stranger. It is typical El Nino year weather. 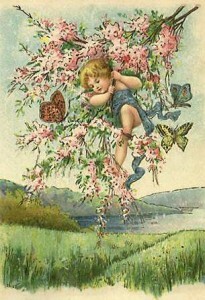 The allergy season has now begun at least 2 months earlier than normal. The swollen eyes, sinus pressure, sneezing, and skin rashes have made a reappearance in me, as well as a lot of others. I am hoping that we will get it done and over with now, and won’t have to put up with it again when it actually is spring! There is always a trade-off, it seems. 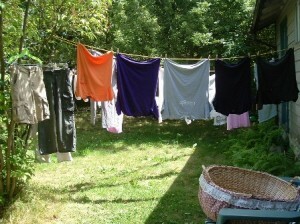 I have been taking advantage of the great drying weather by using my clothesline once again. It feels good to have outdoor-dried laundry…and oh, the sweet smell! It dries so much faster outside, and gives me a reprieve by ridding my house of the indoor drying racks temporarily. Still, for those of us who are used to months and months of dark, cloudy, gray, rainy days it is quite a transition. Some of us don’t know how to react to so much sunshine. Are we supposed to be all happy now? We don’t have the excuse of gloomy weather if we are in a grumpy mood! I have been walking every day… no sitting out for bad weather lately either. My lawn is growing, well…like a weed. My neighbors have been out in full force for weeks, mowing their lawns dutifully. I have managed to elude this by just not mowing quite yet. I usually enjoy the respite I get in winter from not mowing the lawn. I am not ready to start the mowing process yet – it’s technically still winter. So shaggy lawn it is. Sorry, neighbors! But this I know for sure – this too, shall pass. Soon the more typical gray dankness will envelope us. So endure the glorious weather for a bit longer? I guess I must. Posted February 10, 2010 by finnfemme & filed under Daily Life. Valentine’s Day is right around the corner. And, once again, the commercials for Valentine cards, flowers, jewelry…and even “heart-shaped” pizza are airing nonstop. Much to my chagrin, there are two Valentine’s Day commercials that are sort of growing on me. Good grief, I’m now getting emotionally uplifted from commercials! Those copywriters must be working overtime. The first is Jane Seymour’s “keep your heart open” ad for Kay Jewelers. It shows her dreamily painting and designing her open-heart necklace, and telling that her mom always told her to “keep your heart open, and love will find a way.” I know. Kind of hokey. But it actually touched something in me, and made me feel a little happier. You know; sage wisdom from mom, dreamily designing and creating, love, hope, and…jewelry. The second is, of course…drum roll please…Hallmark! This one is not overly schmaltzy, it just seems regular. Like for us normal folk who actually have lives in which we work, raise families, and keep house. But something in it is so touching. A little boy asks his mom who she’s going to give a valentine to…not to dad, but to her best friend who is always there, etc. The mom tells him that would be dad, too. The husband is so goofily disheveled, waggling his eyebrows at his wife putting the groceries away. No candlelit dinner, no walking hand-in-hand on the beach, no gazing into each others eyes. Just happily dealing with normal day-to-day life. You can just tell they are warm, genuine, fun, and are a team. Incredibly romantic.